Fall and winter temperatures bring changes to Mars as the carbon dioxide atmosphere turns to dry ice frost That clings to the surface. The Mars Reconnaissance Orbiter used its powerful spectrometers and cameras to capture detailed pictures and measurements of wintry scenes of nature’s beauty at work on the Red Planet. Fall and winter temperatures bring changes to Mars as the carbon dioxide atmosphere turns to dry ice frost that clings to the surface. The Mars Reconnaissance Orbiter used its powerful cameras and spectrometers to capture detailed pictures and measurements of wintry scenes of nature’s beauty at work on the Red Planet. Frosted crescent-shaped dunes in the Martian North Pole are dotted with bare patches of sand where warming springtime temperatures have vaporized the frost. A Pine Tree Farm on Mars? The triangular spots that look like lines of pine trees are just some of the complex patterns created when winter turns to spring, and Mars’ carbon dioxide frost begins to vaporize and reveal the ground below. In the colder temperatures of late fall, carbon dioxide in the Martian atmosphere condenses into ice and settles on the Martian surface for a long winter’s nap. With spring and summer warmth, the frost will vaporize again to rejoin Mars’ tenuous atmosphere. It stays cold enough to maintain permanent year-round ice near Mars’ South Pole. The defrosting walls of flat-floored pits stand in stark contrast against the carbon dioxide ice. The smallest of the pits, at center, are stadium-size. 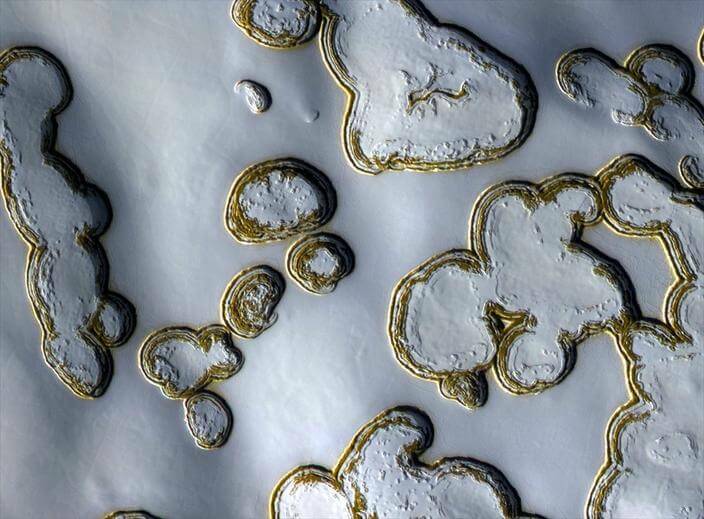 In fall and winter, frost coats the dunes inside 34 mile-diameter Richardson Crater in the south polar region of Mars. Dark streaks and spots are areas that are thawing out. The seasonal ice eventually gives way to reveal the sand beneath. Undulating dunes in the Southern hemisphere’s Aonia Terra are monitored for changes such as gullies, which form over the winter from the action of carbon dioxide frost. Frost was just starting to accumulate on south-facing slopes when this late-fall picture was taken. The long streaks that stripe the walls of this crater are gullies In the Martian winter, frost can build up in the gullies, especially on the cold slopes that face the pole. These gullies are active. Frost causes the gully activity in some as yet unknown way. Looking like holiday ribbon candy, layers of dusty water ice deposits at the Martian North Pole are several miles thick. Frost on the wall of a trough that cuts into these deposits highlights individual layers.